Today is my dear friend Margene’s birthday. Go show her some birthday love please! As I told you last week, I finished the Cable Moss Vest for Dale. You want to see some pictures? I’m so proud of this vest. As you may recall, this was originally to have been my Olympic Knitting Project. But after swatching, I realized there was no way I could complete a project of this magnitude during the time frame of the Olympics. So I set it on the back burner for, oh, about a year. Once I got going on this, though, I found that it went pretty quickly. The fit is perfect. It’s just the right length with just the right amount of ease. 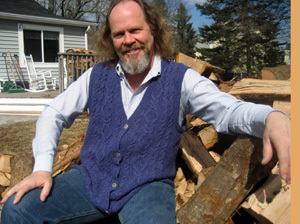 Dale has worn it several times already and he says it’s warm and cozy and just what he wanted in a vest. There’s nothing like that kind of praise to warm the heart of a wife and knitter. Before I started I was quite intimidated by the cables. Truthfully, it was more the cable charts that had me worried. Unlike lace chart and symbols, the cable charts and symbols don’t come easily for me and I had to refer to the charts throughout the entire project. I did color code them, as I showed you in my first post about this project, and that really helped. After the complexity of these cables I feel a lot more confident in my cabling skills. Now that’s a satisfied man. If only he’d stack that wood. That looks fab! Great job, Carole. Absolute PERFECTION! 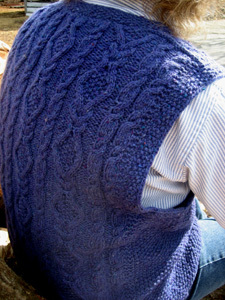 I’m so glad to finally see the photo shoot of the finished vest, especially after all the discussion about the cables. 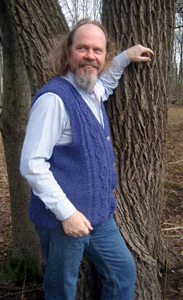 Dale looks very handsome in your handknits! Great Job! Your man wears a vest well. Aww, cables for your cutie — I bet he feels truly loved when he wears it! Congratulations! The vest looks fantastic! It’s so lovely when something turns out exactly how you wanted and expected it. So when are you going to start an Al1ce St*armore, nudge nudge? what a great vest! it must make you feel good to have it done. off to say happy bd to margene! The vest is really quite beautiful – you must be so pleased to have it all come together. And the smile is heartwarming. I really like the fit, especially at the back neck. Nice work!!! Lovely man. That is some nice looking vest on some nice looking guy. Has he stacked the wood yet? A beautifully handsome vest, on a rather handsome man. I can feel the love you have for eack other, thrpigh those pics. That is the most beautiful thing of all. I’d call that wood stacked ! It’s all in the same vicinity ! That is an awesome vest! You should be very proud of it. And your pics are great. What a beautiful job!! I love it!! I knew you could do cables!! It looks like that vest was just made for Dale! I mean, I know it was…quite literally…but I mean it looks as though it was designed just for him. He wears it well, I mean. It suits him perfectly. I’m impressed by how quickly you finished it, too (once you picked it back up again, of course). What a great job you did! The fit, color, design are all superb,and he surely should feel the love while wearing it. What a fabulous vest!!! Beautiful knitting, Carole! Now I want to make this vest, you enabler :). The vest is beautiful Carole. I love the pattern and the colour looks wonderful on Dale. You should be very proud! You did a fabulous job on Dale’s vest….I knew you could do it!! Now get the whip out and get that man stacking! The vest is great and ot looks wonderful on Dale! MAGNIFICENT! 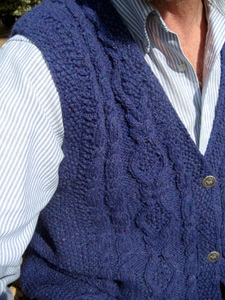 and the vest isn’t 1/2 bad either (Just kidding) It’s so satisfying to see a FO and he likes it, he really likes it…. Beautiful knitting. You should be proud; the color, the fit, the cables, they are all just right. 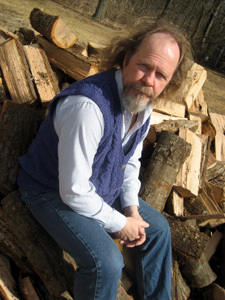 I love the photo on the wood pile. Dale is so cute! The vest looks fabulous! Congrats on your first cabled project! this was your FIRST cable project??? yeowza girl – you did great – it looks fabulous on Dale. congrats on a very beautiful (oops – handsome) project. What a great looking vest! The cables are gorgeous, and it looks fantastic on Dale. Congratulations! that vest nis magnificent carole! you are a cabling supahstah!